PySpark - for applications written in Python2. PySpark3 - for applications written in Python3. Spark - for applications written in Scala. In this article, you learn how to use these kernels and the benefits of using them. An Apache Spark cluster in HDInsight. For instructions, see Create Apache Spark clusters in Azure HDInsight. From the Azure portal, open your cluster. See List and show clusters for the instructions. The cluster is opened in a new portal blade. From the Quick links section, click Cluster dashboards to open the Cluster dashboards blade. If you don't see Quick Links, click Overview from the left menu on the blade. Click Jupyter Notebook. If prompted, enter the admin credentials for the cluster. 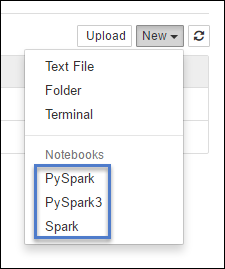 Click New, and then click either Pyspark, PySpark3, or Spark to create a notebook. Use the Spark kernel for Scala applications, PySpark kernel for Python2 applications, and PySpark3 kernel for Python3 applications. A notebook opens with the kernel you selected. Here are a few benefits of using the new kernels with Jupyter notebook on Spark HDInsight clusters. Instead, you can directly use the preset contexts in your application. Cell magics. The PySpark kernel provides some predefined "magics", which are special commands that you can call with %% (for example, %%MAGIC <args>). The magic command must be the first word in a code cell and allow for multiple lines of content. The magic word should be the first word in the cell. Adding anything before the magic, even comments, causes an error. For more information on magics, see here. The following table lists the different magics available through the kernels. "executorCores": 4} Configures the parameters for creating a session. The force flag (-f) is mandatory if a session has already been created, which ensures that the session is dropped and recreated. Look at Livy's POST /sessions Request Body for a list of valid parameters. Parameters must be passed in as a JSON string and must be on the next line after the magic, as shown in the example column. SHOW TABLES Executes a Hive query against the sqlContext. If the -o parameter is passed, the result of the query is persisted in the %%local Python context as a Pandas dataframe. a=1 All the code in subsequent lines is executed locally. Code must be valid Python2 code even irrespective of the kernel you are using. So, even if you selected PySpark3 or Spark kernels while creating the notebook, if you use the %%local magic in a cell, that cell must only have valid Python2 code..
logs %%logs Outputs the logs for the current Livy session. delete %%delete -f -s <session number> Deletes a specific session of the current Livy endpoint. You cannot delete the session that is initiated for the kernel itself. cleanup %%cleanup -f Deletes all the sessions for the current Livy endpoint, including this notebook's session. The force flag -f is mandatory. In addition to the magics added by the PySpark kernel, you can also use the built-in IPython magics, including %%sh. You can use the %%sh magic to run scripts and block of code on the cluster headnode. Auto visualization. The Pyspark kernel automatically visualizes the output of Hive and SQL queries. You can choose between several different types of visualizations including Table, Pie, Line, Area, Bar. The %%sql magic supports different parameters that you can use to control the kind of output that you receive when you run queries. The following table lists the output. -o -o <VARIABLE NAME> Use this parameter to persist the result of the query, in the %%local Python context, as a Pandas dataframe. The name of the dataframe variable is the variable name you specify. -q -q Use this to turn off visualizations for the cell. If you don't want to auto-visualize the content of a cell and just want to capture it as a dataframe, then use -q -o <VARIABLE>. If you want to turn off visualizations without capturing the results (for example, for running a SQL query, like a CREATE TABLE statement), use -q without specifying a -o argument. -m -m <METHOD> Where METHOD is either take or sample (default is take). If the method is take, the kernel picks elements from the top of the result data set specified by MAXROWS (described later in this table). If the method is sample, the kernel randomly samples elements of the data set according to -r parameter, described next in this table. -r -r <FRACTION> Here FRACTION is a floating-point number between 0.0 and 1.0. If the sample method for the SQL query is sample, then the kernel randomly samples the specified fraction of the elements of the result set for you. For example, if you run a SQL query with the arguments -m sample -r 0.01, then 1% of the result rows are randomly sampled. -n -n <MAXROWS> MAXROWS is an integer value. The kernel limits the number of output rows to MAXROWS. If MAXROWS is a negative number such as -1, then the number of rows in the result set is not limited. Selects all records from hivesampletable. Because we use -q, it turns off auto-visualization. Because we use -m sample -r 0.1 -n 500 it randomly samples 10% of the rows in the hivesampletable and limits the size of the result set to 500 rows. Finally, because we used -o query2 it also saves the output into a dataframe called query2. Whichever kernel you use, leaving the notebooks running consumes the cluster resources. With these kernels, because the contexts are preset, simply exiting the notebooks does not kill the context and hence the cluster resources continue to be in use. A good practice is to use the Close and Halt option from the notebook's File menu when you are finished using the notebook, which kills the context and then exits the notebook. When you open a Jupyter notebook, you see two folders available at the root level. The PySpark folder has sample notebooks that use the new Python kernel. The Scala folder has sample notebooks that use the new Spark kernel. You can open the 00 - [READ ME FIRST] Spark Magic Kernel Features notebook from the PySpark or Spark folder to learn about the different magics available. You can also use the other sample notebooks available under the two folders to learn how to achieve different scenarios using Jupyter notebooks with HDInsight Spark clusters. Where are the notebooks stored? If your cluster uses Azure Storage as the default storage account, Jupyter notebooks are saved to storage account under the /HdiNotebooks folder. Notebooks, text files, and folders that you create from within Jupyter are accessible from the storage account. For example, if you use Jupyter to create a folder myfolder and a notebook myfolder/mynotebook.ipynb, you can access that notebook at /HdiNotebooks/myfolder/mynotebook.ipynb within the storage account. The reverse is also true, that is, if you upload a notebook directly to your storage account at /HdiNotebooks/mynotebook1.ipynb, the notebook is visible from Jupyter as well. Notebooks remain in the storage account even after the cluster is deleted. HDInsight clusters with Azure Data Lake Storage as the default storage do not store notebooks in associated storage. Irrespective of whether the cluster uses Azure Storage or Azure Data Lake Storage as the default storage account, the notebooks are also saved on the cluster headnode at /var/lib/jupyter. Jupyter notebooks on Spark HDInsight clusters are supported only on Google Chrome. The new kernels are in evolving stage and will mature over time. This could also mean that APIs could change as these kernels mature. We would appreciate any feedback that you have while using these new kernels. This is useful in shaping the final release of these kernels. You can leave your comments/feedback under the Comments section at the bottom of this article.